Looking for a healthy, nutrient packed dinner the whole family will love? 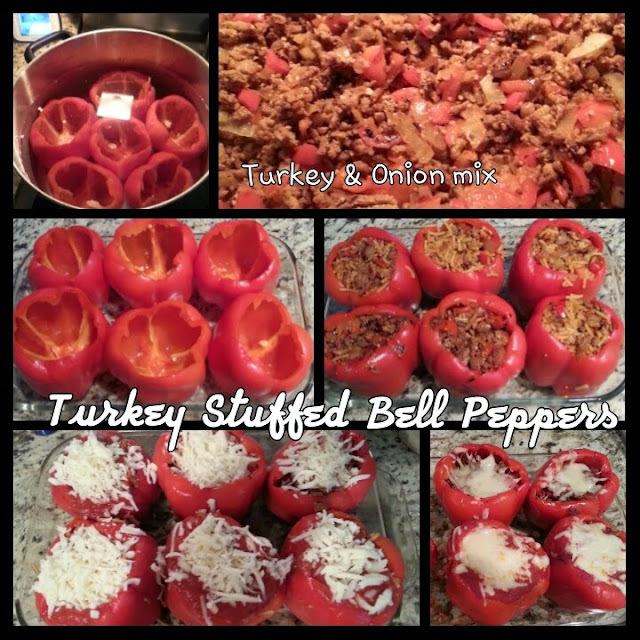 Try my Turkey Stuffed Bell Peppers. They take a little prep time but they're well worth it. If you know you won't have time in the evening, you can pre make the turkey filing, stuff the peppers and leave them ready in your fridge to pop in the oven for 10 minutes when you get home. In one meal, your family will get lean protein from lean ground turkey, antioxidants from pasta sauce, nutrients from fresh bell peppers, healthy carbohydrates from organic brown rice or quinoa and cancer fighting elements from garlic! 2. While the peppers are softening, make your rice or quinoa as you normally would. You can make it in a rice cooker or a pot. Typically it's two parts water to 1 part rice. I make 2 cups of it. Sometimes i have some left over that I just save and eat as a side dish. It's up to you how much rice/quinoa you want to add. I like mine with about 3 parts turkey to 1 part rice/quinoa. 3. As the peppers are softening and rice/quinoa is cooking, brown your onions and garlic (if you want to add them). Garlic is optional. I add garlic to almost everything but not everyone likes it in this recipe so it's up to you. If bell peppers are on sale and I buy a few extra, I also chop a bell pepper or two and brown it to add to the turkey filling along with the onions and garlic. Adds a little more substance, flavor and veggies to the recipe. 4. After browning the onions and garlic, cook the ground turkey. I place the chopped onions in a pan for a few minutes then remove them, put them aside in a bowl and cook the turkey in the same pan. Once the turkey is cooked, I add the onions and mix it together. If you buy the Jennie-O Taco or Italian turkey you won't need to add seasoning but if you buy the plain you may want to add taco seasoning to give it some flavor. 5. Once the rice/quinoa and turkey with onions is prepared, mix it together and add as much or as little of the marinara sauce as you'd like. I typically add about 1/2 cup to a cup but I don't measure. I just go by how I like the consistency. You are now ready to stuff your peppers. 7. Once topped with cheese, heat the oven to 375 and bake for approximately 7-10 minutes or until cheese melts and is a golden brown. Remove from heat, let cool and serve. Enjoy! *For a low carb option, do not add the rice and stuff simply with turkey and onion blend. Sometimes I make a few of each. Low carb for me usually without rice/quinoa and rice/turkey for my kiddos. I prefer the rice or quinoa on the side as a side dish :) Hope you love 'em! Comment and let me know what you think!